It's been awhile since my last post, with no good enough excuse, other than preparing for, attending, and presenting at a conference - the annual meeting of the Association for Tropical Biology and Conservation. Whoo-hoo! 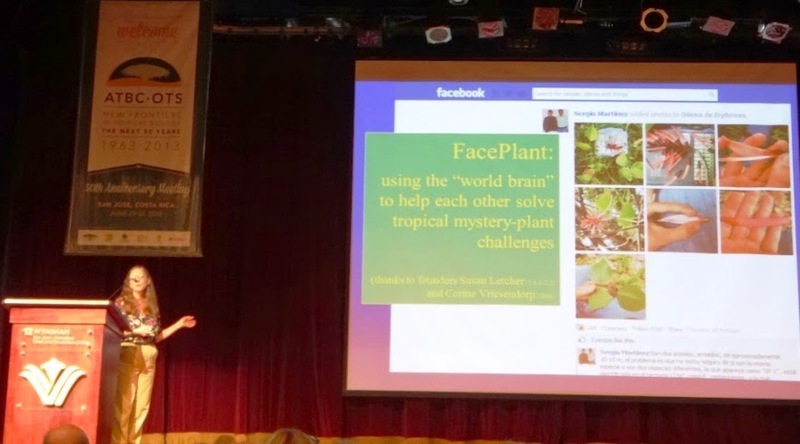 What happens when you stick 900 tropical biologists into a big meeting? A lot of talking about science, cool findings and great photos of tropical species and ecosystems, but also on the loss of said species and ecosystems to the ever-increasing expansion of human activities, and the effect of that loss on other species and ecosystems. Also too few talks proposing how we might stop this downward cycle, but that's another story. There were 6 concurrent sessions at this conference (how to choose? ), and I gave a talk at just 1 of them. Which means I and all the other participants spent a lot of the time sitting. A good amount of research suggests that sitting is the new smoking. Not quite that bad, maybe, but various medical studies have linked sitting for long periods with a series of potential health problems, including obesity, diabetes, and high blood pressure. We humans need to spend less time sitting. Even though many of us exercise regularly in our leisure time, those of us whose current jobs don't require physical labor should keep moving during our work time too. Our evolution from a four-legged gait to a two-legged one allowed our early ancestors to see far and carry water and other provisions while they traveled. In some aspects, our spines are apparently still adapted to a four-footed lifestyle. 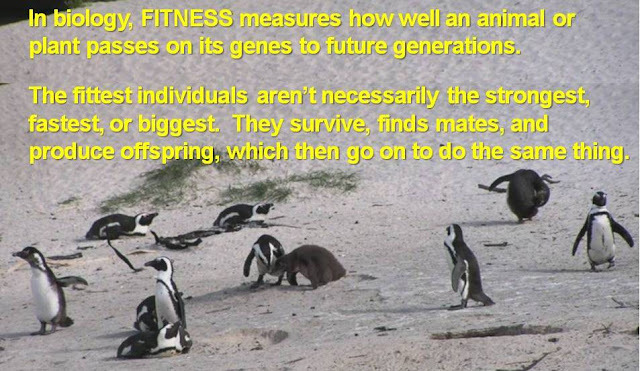 Literally running around on two feet has been our species' daily activity for millennia, and as office work has increasingly replaced hunting and gathering, farming, and other physically active labor, our societal problems of sedentary lifestyles have increased. -- Most obviously, sitting requires less energy than standing, so we burn fewer calories while seated. 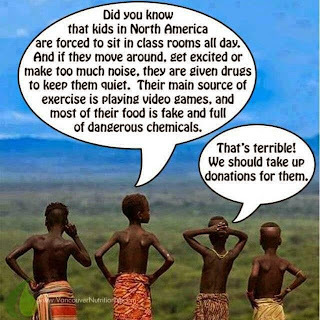 -- You've likely read plenty on the rising obesity epidemic across the globe, even in developing countries, and increased prolonged sitting has played a role in that. 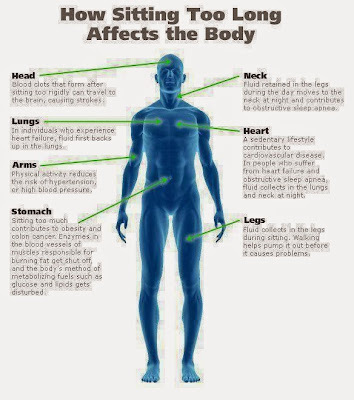 -- Sitting also slows several of the internal physiological processes that break down fats and sugars inside our bodies, whereas standing and moving, even getting up to get some water or coffee, engage these processes. So staying glued to your chair slows your body's metabolism and raises your blood sugar levels. -- Sitting appears to suppress production of an enzyme called lipoprotein lipase, which helps to convert bad cholesterol into good, and it can lead to insulin resistance and trouble metabolizing sugar. 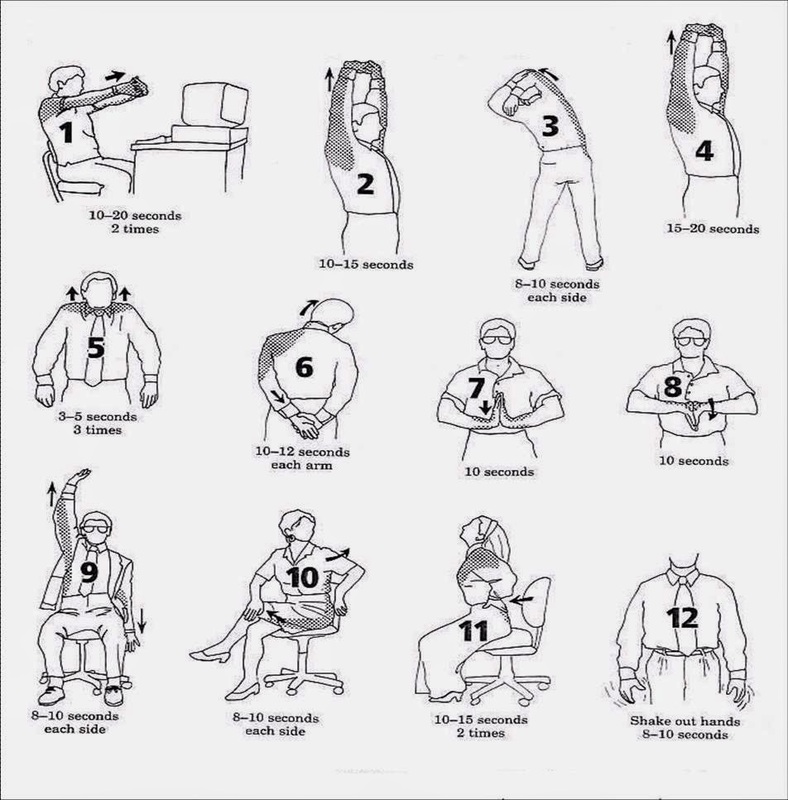 Each of these may help to explain why sitting is associated with heart disease and diabetes. -- In fact, Australian university researchers who surveyed over 222,000 workers found that those who spent 11 hours or more per day sitting were 40% more likely to diet within three years than those who sat for less than 4 hours per day. Yikes. -- Sitting for hours at a time also stresses the back, especially for in people who slouch in office chairs. Any who's taken a long-haul flight would agree. Here's a larger infographic with plenty of info about the dangers of sitting! Don't just sit there. Really. 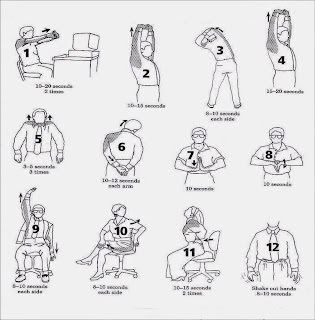 The solution seems to be less sitting and more moving overall, even if you already work out every day. You might start by simply standing rather than sitting whenever you have the chance, such as standing while talking on the phone or eating lunch. This may present a challenge for writers, but I have several colleagues that work at their desk but have grown to value their standing desk. These might seem awkward at first but apparently research participants have found that they enjoy the changes once they get used to them. 1. Maintain good posture while at your desk by keeping your rear-end all the way back in your chair, your feet flat on the floor, and your head straight. Key point for fellow laptop users - try connecting to a raised external screen so you don't have to look down all the time. 2. While sitting, move and stretch your neck, back, ankles and legs, using stretches like those recommended on airplanes. 3. 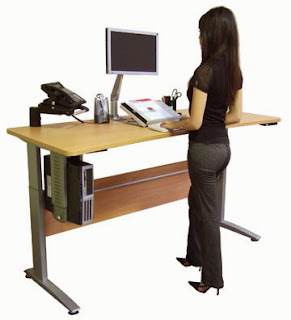 Try to stand at least once every hour at your desk. If possible, try placing your hands on your lower back and stretching backwards. If your workspace is even a little private, go ahead and shake out your hips, legs, and arms too. 4. Use any opportunity to move around. Take conference calls or your coffee break while standing. If you're colleagues are willing, try a "moving meeting" by walking up and down the hall or even outside. That goes for your lunch date as well. 5. Encourage ABW -- activity-based working -- a business philosophy designed to cuts down on the use of paper, landline telephones, and personal desks and desktop computers but that also gets employees moving around their building much more. I haven't seen this myself, but employees at several banks in Sydney, Australia conduct their work and meetings on couches, conference tables, standing desks, or private booths in their wireless-powered building, depending on the tasks they need to complete that day, using laptops they store in personal lockers. 6. Take some suggestions of ways to replace sitting (and eating) with walking more per day from this LA Times photo gallery. It targets Los Angeles but you can apply it to your city or town! Researching this post has definitely motivated me to make a conscious effort to try standing more often - not only to help reduce the risk of all those modern (sedentary) lifestyle ills but also to support/help that healthy body and mind we all strive so hard to maintain.